Mayan culture was a very vibrant culture and they seemed to enjoy life to its fullest extent. Even the religion which they followed, despite having some unpleasant aspects such as the human sacrifice, had dancing and singing as essential elements. Mayan people played a variety of Mayan sports for entertainment and in their leisure time. Among these sports, the Mayan ball game was easily the most important and most widely played and had religious significance. But there were various other Mayan sports as well which people from all social backgrounds played with equal zeal. By far, the most popular of all Mayan sports was the Mayan ball game which was played in the Mesoamerican religion from about 1,400 BC. The game had various variations over different places and rules also varied to some extent. The common form of this game consisted of players striking the ball with their hips. In some other variations, they were also allowed the use of forearms, rackets, or bats. Solid rubber was the material of the ball and it had a weight of about 4 kg. A lot of these ball games were accompanied with grand events which sometimes even included the ritual of human sacrifice. Heavy betting was also involved in the game but it was also played as a simple recreation game by children and even women. Mayan culture was a very vibrant culture and they seemed to enjoy life to its fullest extent. Mayans built special ball courts where the ball game was played. These ball courts had varying sizes and also differed in the shape. One of the largest ball courts was located in the Mayan city of Chichen Itza. This Great Ball-court was 225 feet wide and 545 feet long. The construction of this ball court was such that even a whisper at one end could be heard at the other end about 500 feet away. At each end, there was a raised temple area which could be used for different kinds of rituals. According to the Mayan legends, brutal rituals were involved in this game and sometimes the losing captain presented his head to the winning captain who then decapitated it. This, although very brutal, was considered an honour of highest degree. The winning captain was thought to go straight to heaven without traversing the 13 intermediate stages that every other mortal had to go through. Another important Mayan sport was called Tlachtli which involved keeping a grapefruit-sized rubber ball in air with the use of thighs, hips, and chest. The game was also known by various other names such as pok-a-tok, pitz, tlacho, and ulama. 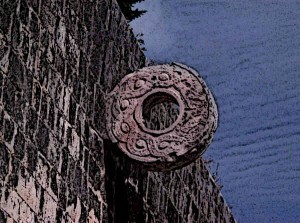 In some later variations of the game, the goal became knocking the ball through hoop-like stone rings which were hanging downward from a wall in the centre of the court. This game, like various other Mayan sports and cultural aspects, is thought to have been invented by the Olmecs who lived before the Mayans. Subsequent cultures such as the Aztecs also played this game with their own variations added to it. One of the most strenuous and demanding Mayan sports was Jai Alai. Just like various other sports, this one was also played by almost all the Mesoamerican cultures and was even adopted by the Colonial Spaniards. This game is played between two players. One of them is the server who has a wicker basket tied to the right hand. He hurls the hard-rubber ball against the granite wall. After hitting against the wall, the ball has to land in a marked zone. The opponent is then supposed to catch the ball in a single motion and hurl it again. A Point can be scored in two ways: either if the player fails to return the serve or is not able to hurl it into the marked zone. The ball is hurled and returned at fairly high speeds which require a lot of agility and physical exertion. The players often wear helmets to protect themselves from the high speed ball. Among the Mayan board games, Bul is particularly noteworthy. This is a dice game which involves the use of grains and mathematical calculations. The game can be played by two individuals as well as two teams. It is considered a war game because the ultimate objective is to capture and kill the playing pieces of the opposition. Equal playing space is reserved for the two players using rods placed parallel to each other. Even number of stones or figurines are placed in the respective basis by the players and this commences the game. The stones are moved in different positions depending on the roll of four dice. The dice are painted yellow and black and the number of faces determines the number of spaces to be moved. For instance, with 1 yellow face 1 space is moved, with 2 yellow faces two spaces are moved, and so on. If all faces are black, 5 spaces are moved. When one player’s stone lands on the space where there is already the enemy stone, the enemy stone is captured. Patolli was another Mayan game which was equally famous among other Mesoamerican cultures, particularly the latter Aztecs. The rules of this game involved moving six game pieces along different squares on a board. The end goal was to get all the pieces from the starting square to the ending square before the opponent. Five or six bean pieces were generally used as dice. This game involved heavy betting and all sorts of items such as gold adornments, blankets, precious stones, and other material possessions were used for betting. In extreme cases, the players could even bet their homes and even their freedom. Mayans had a variety of Mayan sports for entertainment and leisure time. This included sports which required considerable physical exertion as well as those played on the boards. The most famous of all Mayan sports was, of course, the Mayan ball game which had a ritualistic status and large ball courts were built specifically for this game. But they also played various other kinds of games such as Tlachtli, Jai Alai, and board games like Bul and Patolli.